The inguinal nodes - groin area. I had a lymphangiogram done in 1966 and a lymphoscintigraphy done in 2006 - and they showed me missing significant numbers of inguinal nodes. In 1962, when I was nine years old, I had an inguinal node removed due to necrosis from cellulitis - in left leg. In 2000, I had a small needle biopsy on an inguinal node in the right leg. Yep....it was positive. In 1995, I was diagnosed with mixed b-cell lymphoma. 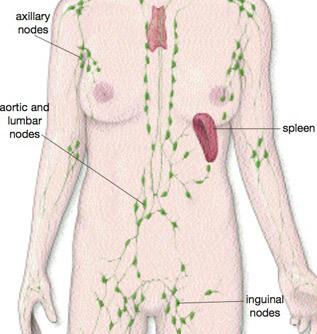 Lymph nodes - female. Though the abdominal nodes will be different due to different organs, the inguinal nodes remain the same.